In the event of an accident, it is essential to be able to quickly locate qualified first aiders who can assess the injury and administer the necessary treatment. Our first aider signs are a cost-effective way of providing information of the first aiders on the premises, allowing both employees and visitors to access the help they need. For help with choosing first aider signs, see our buying guide. Once you have selected the first aider signs suitable for your premises, browse our comprehensive selection of sign fixings to ensure that the signs remain firmly attached. Rapid assessment by a qualified first aider can make all the difference in the event of an accident or sudden illness. By displaying first aider signs clearly at the appropriate locations throughout your premises, you can ensure that everyone can get the swift help they need in the event of an accident or injury. 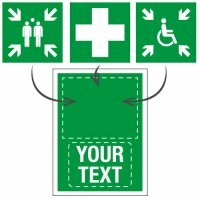 Our first aider signs are available in a range of sizes and materials, some of which are suitable for both indoor and outdoor use. See our handy guide to sign materials for more information. All of our first aider signs feature the easily recognisable white cross on a green background. There are a number of options for the information that you can provide using these signs, including the names of first aiders, their location and where to find a first aid box. Most are designed to be written on, but the updatable first aider sign can accommodate a piece of printed, A4 paper; giving a professional finish. If space is at a premium, you may like to opt for a combined first aider and fire marshal sign to conveniently provide all of the information for key personnel within your organisation. For areas that are prone to damage and vandalism, then a vandal-resistant sign should be considered. As the names and locations of first aiders can regularly change, all of our first aider signs are designed to be easily updated so that you can provide the most recent information without added expense. While Seton supplies a wide range of first aider signs, we recognise that every work premises is unique and may have different requirements. If the first aider sign that you require is not included in our range, then we can create a custom-made sign displaying the exact information that you need. Because the rapid treatment of injuries is so important, first aider signs should be displayed in conjunction with our first aid location signs so that there is no delay in obtaining first aid treatment. Accidents happen, even in the best-managed workplaces. Being promptly treated by a qualified first aider can prevent minor injuries from becoming more serious. Take care of your employees and visitors by ensuring that they know where to go and who to see in order to receive first aid treatment. You can shop for first aider signs at Seton with confidence – as one of the leading retailers of workplace signs and equipment, we ensure that all of our products comply with current UK and EU legislation.